Today we continue our tour of Icelandish bookishness! 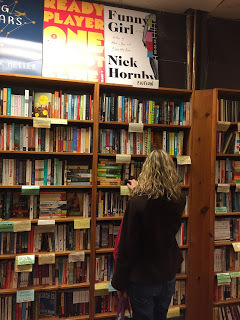 We’ve already talked about the libraries, so today: bookstores. And also: words everywhere. Words we could not decipher. We begin with The Bookstores. 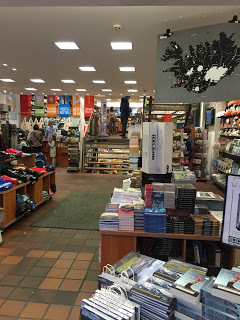 The biggest bookstore chain in Iceland is Penninn Eymundsson, and their stores are pretty great. Their displays are tantalizing, and they have a tempting selection. If you’re ever in Reykjavik and have time for only one bookstore visit, here’s the place to go: the Penninn Eymundsson at Austurstraeti 18. It’s right downtown, on a wonderfully walkable street (near the public library!) and they have level upon level upon level of books, plus a coffeeshop at the top floor. While we were there, the Dear Man took the opportunity to study up on local customs. We also visited Mal og Menning on Laugavegur, one of the main shopping streets in downtown, which had some enticing displays. And we stopped by Bokin, a used and rare bookstore just off Laugavegur. And the bookishness raged on, people! At the Culture House in Reykjavik, they did wonderfully clever things like reinvent the guestbook as a card catalog. They provided index cards, and you got to sign the card, date it, and then alphabetically file it in the appropriate drawer! …which all makes sense, given that Reykjavik has been designated a UNESCO City of Literature. Iceland: the place is full of our bookish brothers and sisters! The other thing that the Dear Man and I both noticed repeatedly, is that the Icelandic language is not the easiest thing in the world for the uninitiated. And as we were driving (he was driving [I was “navigating,” heaven help us]), I was calling out place names that I mispronounced so horribly I kept cringing. And I kept decrying the fact that I couldn’t figure out the meaning of the words, and having no data plan, couldn’t Google a translation on the fly. So one of the things that was completely lovely about visiting Iceland was that not only is the scenery lovely, but the culture is Hella literary. My fellow bookish travelers… What’s the most literary place you’ve ever visited? As I write this, I’m suffering severe skyr withdrawal. You can get the stuff here in the States, but it just ain’t the same. The skyr in Iceland is light and sweet, and it makes you feel like you’re eating whipped cream for breakfast! So… Iceland: best travel destination ever? 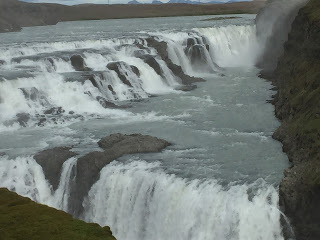 Prepare yourselves for some Icelandic bookish posts — libraries (that’s today’s topic), bookstores, and books about Iceland. And if the spirit moves me, maybe some photos of the scenery, since that’s the actual reason we went there. And man! it did not disappoint. …and were greeted by a sign that instructed us to either remove our shoes or don booties. Apparently the former librarian made this a rule, and they’ve stuck with it. And admittedly, they have some gorgeous hardwood floors in their library, so you really can’t blame them for keeping the place nice. So we put on the booties and walked in. And then it was like old home week, and the librarian and the library assistant told us all about the library and answered our questions, and it was really lovely. For a town of 1100 people, it was very well done. We also visited the Reykjavik City Library. It’s in a great downtown location, in a multi-floor building that’s very pleasant. Again: large English language section! And I was intrigued by their use of Dewey Decimal Classification, even for fiction. The chief difference that struck me was that their libraries aren’t big into providing computer access. Maybe because Iceland has an impressively high percentage of households with Internet connectivity? Anyway… we fit in one more library visit shortly before hopping on the shuttle to the airport. We swung by the National and University Library of Iceland and walked through. Iceland’s known as a bookish society (more on that in the next post), so it seemed fitting that we’d choose to library it up during our visit. At least this was our excuse. So, my fellow book nerds… Ever visit libraries while on vacation? 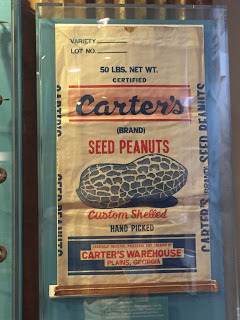 During this delightful whirlwind of a summer, the Dear Man and I headed to Georgia because Atlanta is the home of the Jimmy Carter Presidential Library. Cuz yep, we’re collecting the whole set. Jimmy Carter… not our favorite President, even though he seriously seems like a really good person. Dang! We might actually see him when we’re there! Of course, I’m sure the fates decided that because of Thought 1, we were bound to be disappointed when it came to Thought 2. We made the best of the disappointment, though, because the Carter library/museum was really well done. … to accompany the truly wretched campaign song the Dear Man likes to play for me. A full wall of archival boxes on dramatic display! Rapture in the librarian heart! The thing I really wanted to see (other than President Carter himself) was The Cardigan. I was pretty sure they’d have it, and Yes They Did. I buttoned up in its honor. And to top it all off, there was a farmer’s market in the parking lot, so: Georgia peaches!! The Carter Center, the public policy organization run by Jimmy and Rosalynn Carter, shares the same grounds, and the whole place is lovely and peaceful and filled with good feeling. It’s right there in the city of Atlanta, but it feels like a world apart. The museum brought back lots of very early memories… like being in the voting booth with my mom when she cast her vote in the 1976 election. In that moment, a political junkie was born. So, my fellow Americans… What are your memories of the Carter years? While on a recent road trip, the Dear Man and I noticed a fair number of references to the Black Hawk War. And then we realized that we were living right in the middle of a place filled with history, and we knew precious little about it. Being industrious, curious types, we set out to fix that. The Dear Man asked the Librarian if she’d considered reading Black Hawk’s autobiography. Flash forward one week, and I had a copy in my hands. Flash forward another week, and he also had a copy in his hands. And then we started learning all kinds of cool stuff about a nearly forgotten period of history. Cuz, YEAH: dude served in the Illinois militia (never saw battle, but buried some scalped soldiers). The cool thing about this book is that it’s told in Black Hawk’s words. Or at least, sort of. My only real complaint with the book is the inclusion of way too many exclamation points and italicized words for emphasis. And in some places, I doubted that Black Hawk would have spoken in the way the words were written on the page. But at least we get his viewpoint. And that’s explanation enough for this book to still be in print more than 175 years after its initial publication. This is a book that doesn’t go down easy. I found myself seething at the way Black Hawk’s people’s land was taken from them. I kinda got worked up. Then I recalled the passages where they’re doing the scalp dance, and I shuddered. Then I thought about them approaching the militia with a white flag of peace and being fired on. And I got worked up again. It was fascinating to see the episodes through Black Hawk’s eyes, and to understand it from his perspective. He’s narrating the story as an older man, near the end of his life, and while he’s faced plenty of hardship, his spirit is still lively. Besides describing the battles and difficulties faced by the Sauks, Black Hawk also paints a detailed picture of their daily life. Visiting the Hauberg Indian Museum, located at the Black Hawk State Historic Site in Rock Island, Illinois, reinforced the descriptions of the Sauks’ annual cycle of farming, hunting, and trading. The museum has a fine display, some great artifacts, and some really good maps that helped us find our way to the area nearby where Black Hawk was born and lived. We read the Donald Jackson edition, which is also the edition on display at the Hauberg Museum, so it’s got some decent cred. The thing I liked about this edition was Jackson’s terrific introduction. He sets the scene, including some unexpected details, such as a riveting description of Black Hawk’s hair in comparison with the hairdo of Andrew Jackson. And Donald Jackson analyzes the validity of the autobiography and its various versions over the years, and that’s good stuff, too. So… what books have inspired you to take to the road? On our recent trip to my home state of Iowa, the Dear Man and I seriously touristed it up. 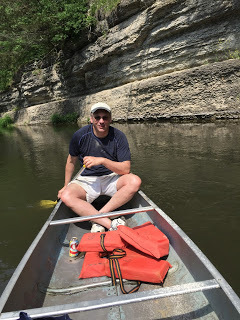 The aim of the trip: canoeing the Upper Iowa River. And that was pure delight. The Dear Man squired me around in a canoe while I ate snacks (and occasionally paddled). This was our 4th river, and it was the bluffiest of the bunch. 93 degrees and Iowa-humid? We got this. And then there was All The Other Stuff. We stopped by Dragonfly Books in beautiful downtown Decorah. It’s a new-ish bookstore, and it’s super cute. I liked all the things: their displays, their selection, their layout. And I bought this book, by Stephen King, which has been on my TBR forever. And we stopped by a stone cottage built by a Revolutionary War veteran, and there was a darling Little Free Library installed by a Girl Scout! And we visited my college campus (Go, Norse!) and I showed the Dear Man all the important places, like the path where my friends and I impersonated the Dead Poets Society guys in our duffel coats. And Mabe’s Pizza: we ate there. And Dunnings Spring: we walked there. And there were trolls, because: Norwegians. And there was a cave tour and rhubarb pie and a hidden military cemetery and a drive-in and an old fort and a roadside stand and ice cream at the Whippy Dip. So, my fellow book lovers… What are your bookish travel plans this summer? 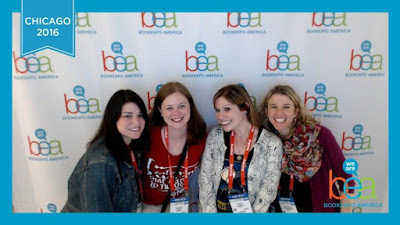 BEA was crawling with authors, and they were gracious toward us mortals. The first two are super common. The third happens through pure serendipity. Dude, I got the trifecta. I’m completely convinced that the best way to experience BEA is to become some amazing person’s wingman. I got to hang out with Katie of Words for Worms (that lady knows the books) and Marisa of The Daily Dosage (that lady knows the publishers)*, and one of them had this event on her radar. So Robyn Carr and Susan Elizabeth Phillips are my two favorite romance authors. Actually, they might be the only romance writers I really read. Anyway, they had the Big Names on this panel. Romance is about finding perfect love. Women’s fiction is about a woman finding herself. And then Robyn Carr signed books and talked with us, and I’m pretty sure I overshared. Sometimes, when authors are interviewed, they tell secrets. This can be scary, my friends. Authors. I know they’re people just like us, but seriously: scary. I tend to either be dumbstruck or I ramble. There’s never any normal. So, thank you, authors of BEA 2016, for your kind forbearance. My favorite book signing experience was when Jane Hamilton — such a gracious and lovely human! — signed a copy of The Excellent Lombards. I adore her books, and I like her every bit as much. Since she is a remarkably nice person, we had a normal human conversation (though it lasted too long for her assistant, who started hustling the line along. Sorry, Katie! I’m still feeling bad about that.) Years ago, Jane Hamilton had spoken at the library where I worked, and we were reminiscing, I was gushing, it was maybe a little weird on my part. So here we’ve got the wild card: the random author encounter in an unexpected place. So heading home, heavy laden with books, I was concerned that I was gonna repeat that snafu. I was meandering around in search of the bus stop, when a man asked if I needed some help. We ended up walking to the El station, which was nearer than I’d realized. I asked him what brought him to BEA, and he said he was a journalist. Then he said something that made me realize he was also an author, and I asked his name. I had been directionally rescued by a bestselling, award-winning mystery author. I did a mild freak-out, then calmed down and requested photographic evidence of this episode (because that’s normal behavior; see “authors freak me out,” above). 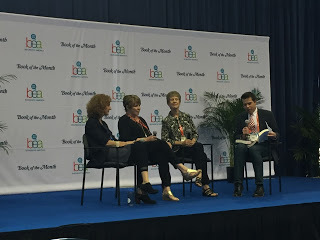 At BEA, not only are there authors all over the exhibit floor, but they’re also unleashed on the wider world to wander at will. You May Encounter Them In The Wild. So I know when we think of BEA, we think: books. But I gotta say: it’s all about the people. We’re right there with ya. Today we’re talking about the books. Oh my land, people. The BOOKS! Here are photos of my haul, at various stages of the event. So yeah… that last photo, of the Day 3 books. Uffda, people. I hauled those puppies ¾ of a mile to the El station, which required a peanut M&M purchase en route to stave off crankiness in this here pack mule. It was not pretty. Noon: Thank goodness I get to set down these book bags while I eat, because this ain’t good. Afternoon: What was I thinking? But I kept seeing books that I knew my colleagues would be interested to read, and I really didn’t want to let them down. I was a woman on a mission of bookish mercy, doggone it. So, yeah. 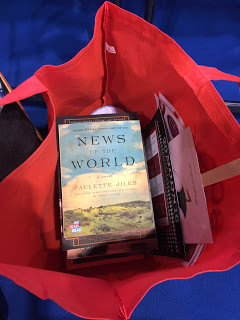 I was like a one-woman library, stumbling down the road from McCormick Place with my usual grace (I have no grace), very thankful for all the beautiful books. Side note: Thank goodness for eGalleys. They Weigh Nothing! At least 3 times a day, I had Bliss Moments. That’s how good it was. Book bloggers and librarians and all the other book people are some of the loveliest people in the world. They’re my tribe. And I got to hang out in their midst for Three Whole Days. Most exciting: got to meet — In The Real World — book bloggers whose work I adore. These ladies are smart & funny & generous of spirit. I can’t imagine BEA without ’em. You made Book Expo the best! We got to tramp around the miles of McCormick Place together & talk books & give each other reading suggestions & laugh a lot. And then they wrote amazing wrap-up posts like this (Katie, we’re looking at you!) and this (Julie: so doggone organized, it’s freaking me out!) and this (Marisa, who fully captured the joy of the shared BEA experience). OK, so this is just Part 1 of “why BEA was so doggone amazing.” Stay tuned for more. So there I am, walking along to warm up for a run, and guys! 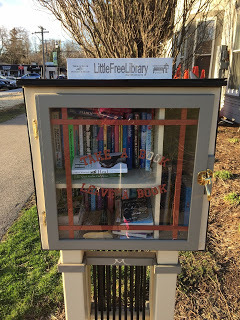 Little Free Library! Right here in my very own town. So I stopped and peeked in there to see what-all they had. It was actually a decent mix of fiction and nonfiction, stuff for grown-ups and stuff for kids. So now it’s become kind of a ritual. As I’m warming up, I swing by and peek into the Little Free Library. So then, on a recent day off, I decided to dash down there to add a book to the Little Free collection. I placed the book in the Library, and was closing the door when I saw it: a book I wanted to read. A book that hadn’t been there 7 hours earlier when I took a look before my run. Reader, I borrowed that book. Proud new borrower here, of Shabby Chic by Rachel Ashwell. I’ll peruse it while belting down some super-charged black coffee. Oh my land. This place is a little bit of heaven, plunked down in the middle of an old city block in Chicago. It’s been here for years (since 1980), and of course I’m only just now getting the memo. Magnificent librarian Leah White mentioned this bookstore during a presentation about marketing books, and the way she described it, I had to make a nearly immediate pilgrimage. The Dear Man and I braved cold weather and inhospitable city streets (thank goodness he’s a marvel at parallel parking), and it was so worth the effort. The way they promote books is utterly intoxicatingly. Three steps in the door, and I got snared by a display of children’s books, each with a captivating shelf talker underneath its face-out cover. I lingered for 5 minutes, even though I’m not a frequent reader of children’s books. I was totally enraptured by the allure of that display. Then it got even more intense: a display of previous nonfiction bestsellers, oodles of shelf talkers in the fiction area, a display of their top 35 favorites of 2015 (each book with a shelf talker), and scattered shelf talkers throughout every area of the store. And we lingered a really long time. I kept exclaiming over every marvelous notation by a bookseller.